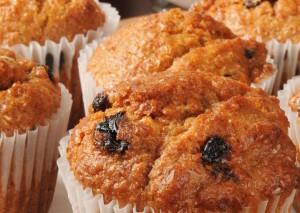 A delicious high fiber muffin packed with a punch. Take one for breakfast and it will keep you going till lunch. Guaranteed. Preset the oven to 400oF. Line a 12 cup muffin tin with muffin cups. In a bowl, dry blend together all the dry ingredients (except for the raisin). In the mixing bowl, cream together the butter and brown sugar. Scrap down the bowl, and whip the mixture till fluffy. Gradually add in the egg and the water. Scrap down the sides again and mix till there are no lumps. Gradually add in the dry ingredients till the batter stiffens up. When the flour is all blended in, add in the raisins and mix for another 1 min. Use an ice cream scoop to fill the muffin cups. Bake in the oven for 18- 20 minutes. It can be removed from the oven when an inserted toothpick comes out clean. Cool on a cooling rack for 20 mins before serving. This muffin will stale a little faster due to it's lower fat and sugar content. It would keep better in the freezer. Ingredient statement: Brown sugar, raisins, whole wheat flour, butter, water, eggs, wheat bran, powdered buttermilk, baking soda, cream of tartar, cinnamon, salt.